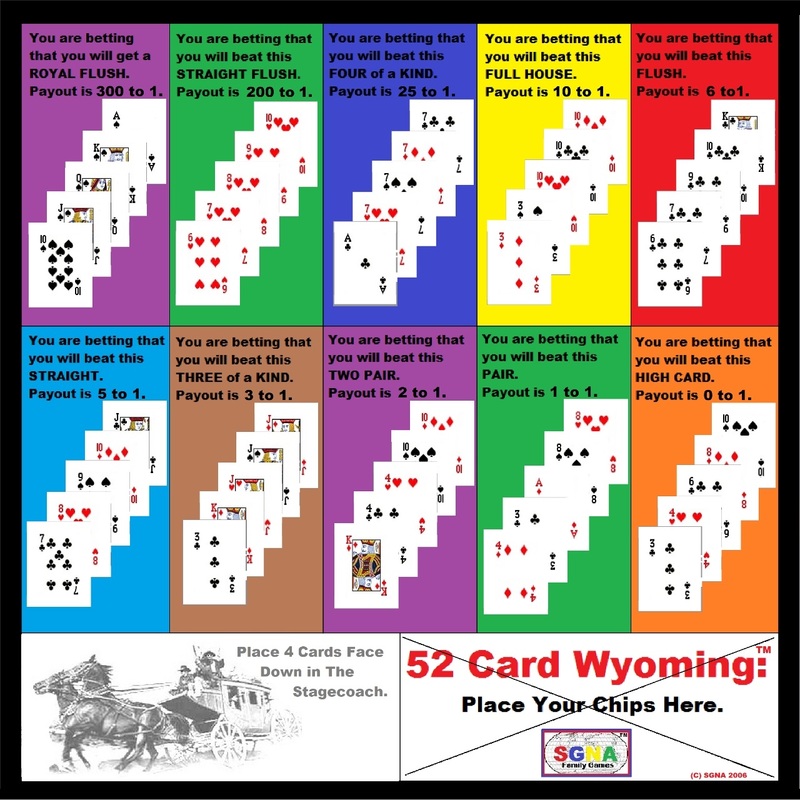 52 Card Wyoming:tm is a fantastic & new betting board game!! A deck of poker cards. A role of poker chips. 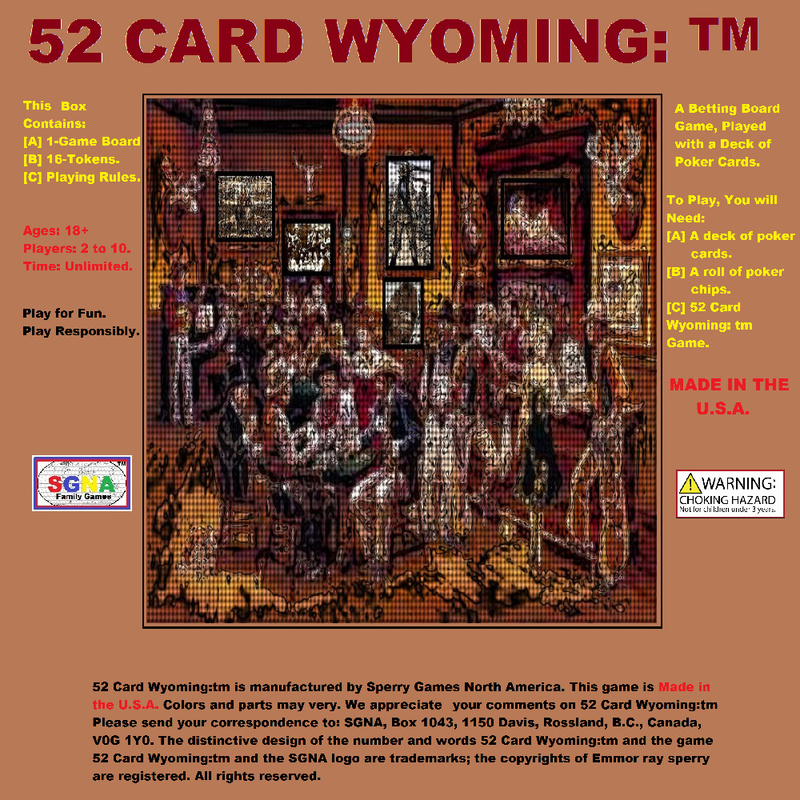 52 Card Wyoming:tm board game. Number of players: One to any number of players, but the game is comfortable with Four to six players. Time to play: There is no time limit. 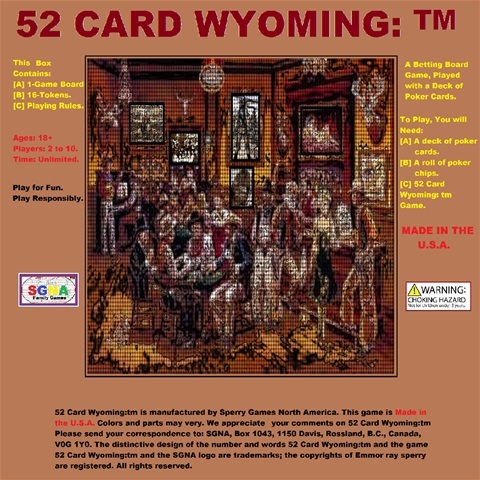 52 CARD WYOMING-tm is played with one deck of 52 cards, [Traditional poker playing cards] there are no wild cards or jokers. All card suits are the same value in this game. size and shape. Each players tokens are different from the tokens of the other players at the table. One of a players tokens sits in front of the player at the table and the other token is used on the game board during a round of play. With this system the house can see who owns the tokens that are on the playing board. Every bet is one chip & the ante is one chip. The maximum bet a player can make in one hand is total of 5 chips. In a round the chip value/color can not change. At the start of the game, the house sets up the board and invites people to play. then asks the players to ante in one blue chip, in the rectangle labeled on the game board. The players place one of their tokens on one of the poker hands that are labeled on the game board; On a poker hand that the player is hoping to beat [the players token stays there for the rest of the hand]. . And then the player places one blue chip as ante to start the game. The house deals four cards face down on the stagecoach area of the board. [The house nor the players know the identity of these four cards.] The house then deals six cards from the top of the deck on to the table, and then turns two cards over and leaves four cards face down . A player then bets a blue chip on the two face cards or folds. The idea of the game is to beat the hand that the player has placed his token on; from the house hand. If the cards that have been turned up during the hand, reveals that a player has won; then that player can no longer bet. The house then turns one of the four down cards, face up. The players then bet one blue chip or fold. The house then turns one of the three down cards, face up. The players then bet one blue chip or fold. The house then turns one of the two down cards, face up. The players then bet one blue chip or fold. The house then turns the last down card up. If the best five card poker hand from these six cards, is a better the poker hand, than the hand that the player put his token on, the player wins and receives his pay out from the house. For example, the poker hand reveals “Three Queens” and the hand that the player placed his token on, at the start of the hand, was labeled [You are betting that you will beat this Three of a Kind [3 Jacks] payout is 2 to1] that player has won double the blue chips he bet, on that hand. The house collects the antes from the players that lost and pays the players that won. The house then pushes the cards in that hand over to the side in a separate pile face down. The house then asks the players to ante and place their tokens again. The house then deals six card from the top of the deck on to the table, and then turns two cards over and leaves four cards face down. Betting and the play sequence, continues as before. The house collects the antes from the players that lost and pays the players that won. This sequence of events is done eight times and then a “Round” is over. [Eight hands of 6 cards in each hand equals 48 cards and 4 cards are face down in the proper area of the game board] . If a player folds in the middle of a hand, he should remove his token from the game board. If at some point of a round, there is a tie between the players hand and the game board hand; the player wins.